Double Bass - Hire a double bassist for recording sessions. The Double Bass is the lowest and largest member of the family of instruments that make up a string section. It is an instrument which adds depth and weight to the sound as a whole and its role is often to provide an anchor, releasing the cello for more lyrical passages. Although composers and songwriters who wish to hire session string players for a track often overlook the double bass, a skillful double bass player can make a glowing sound as a solost in their own right. Clients looking to hire a double bass player for recordings can take advantage of string arrangements which provide an extra dimension to the overall sound of a string orchestra. In addition, a solo session bass player can be essential for jazz and light music, with a distinctive pizzicato sound exclusive to this instrument. 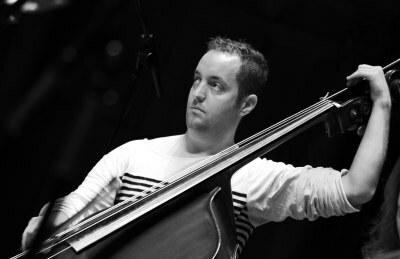 A busy freelance and session double bassist, Ben regularly works as guest principal in many orchestras such as the Academy of St Martins, English Chamber Orchestra and the City of London Sinfonia. In the West End he has played for The Sound Of Music, Napoleon and Lord of the Rings. As a chamber musician he has been asked to play with the Allegri and Sacconi Quartets as well as the Kungsbacka Trio. Ben studied at the Guildhall School of Music and Drama with Thomas Martin, Kevin Rundell and Stephen Williams. During his time there, he was generously supported by the Countess of Munster Trust, Musicians Benevolent Fund and the GSMD. Steve studied Double Bass at the Melbourne Conservatory of Music before holding a position with the Adelaide Symphony Orchestra for two years. On moving to the UK, Steve furthered his studies at the Guildhall School of Music and Drama and has enjoyed a busy freelance career in London both in classical and jazz genres. He has appeared in many West End shows such as Woman in White.